An Opinion On Sports: Derek Dooley: "You Play To Win The Game"
Former NFL head coach and current ESPN commentator Herm Edwards made the phrase "you play to win the game" popular when he was coach of the New York Jets. Yesterday in Knoxville, Tennessee coach Derek Dooley obviously did not have Herm Edwards on his mind. With less than a minute remaining in regulation and his team tied with Missouri 28-28, Dooley chose to run out the clock and go into overtime. Even with a quarterback on the field who ended up throwing for over 400 yards in the game, Dooley elected to play conservative. Although his Volunteers had yet to win an SEC contest this year, Dooley sat on the tie. What in the world did he have to lose if he let Tyler Bray attempt a couple of long passes? I guess he was relying on home-field-advantage to help pull out the win (like that had been an advantage this year anyway). Well, Dooley's decision forced the game into "free football", where the Tigers prevailed 51-48 in four overtimes. Tennessee remains winless in the Southeastern Conference. 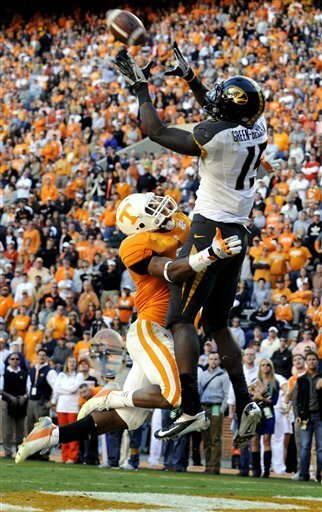 Shame on you Derek Dooley.